La Sebastiana, up on Cerro Bellavista in Valparaíso, one of famous Chilean poet Pablo Neruda’s houses-turned-museums is well worth the trip for a number of reasons. One, it will get you off the main tourist hills of Cerro Concepción and Cerro Alegre, into a quieter part of Valaparaíso where grandmas come out and sweep the front stoop every morning. The second of course, is the museum itself. It’s set inside a grassy yard, with a café at the entrance. There are descriptive texts available at the front door, and museum docents in every room, as well as an audio guide available in several languages. 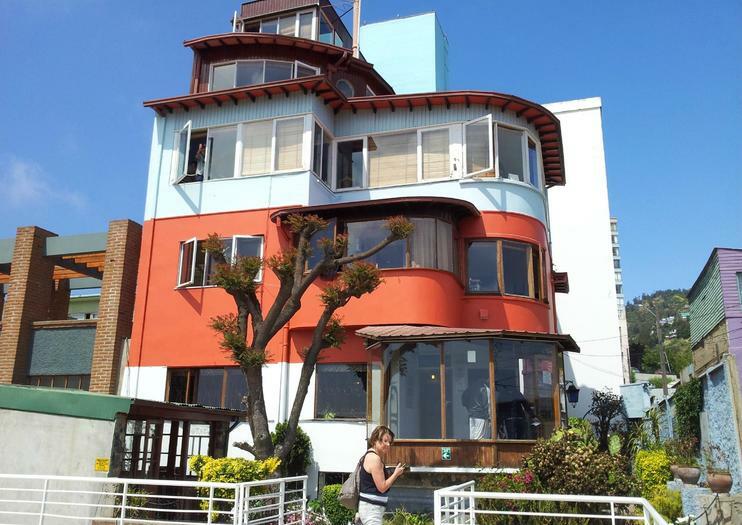 Of all of the three houses turned museums that famous Chilean poet Pablo Neruda left behind, this is perhaps that one that most encourages you to look out the windows, with multicolored houses perched on the hills all around, and an expansive view of the ocean. Inside the house, there are ocean-related relics like seashells, buoys, collections of books, and carved wooden music boxes, in addition to poems printed throughout the house, that explain in Neruda’s own words, how he felt a need to be close to the ocean, after spending time in landlocked Santiago. Neruda originally bought the house in the 1960s, and inaugurated it with a big party, similar to the ones he also held every New Years’ Eve to watch the Valparaíso fireworks, which still take place yearly. After his death in 1973, the house suffered some damage, and was later restored, quirky decorations and all, to its current state in the late 1990s, with the help of Telefónica España. The gardens are a pleasant place to sit for a while, and pose sitting on the bench with the Neruda cut-out, a classic La Sebastiana photo. Entry is on a first-come, first-served basis, so if you have lots of other plans for the day, like visiting a nearby winery, or a walking tour of the city, early morning is a good time to visit. If you’re lucky, you may be there just as the fog is burning off the horizon, and the fabulous views over the nearby hills and bay are revealed. Combine two great Chilean attractions into one with this full-day trip to charming Valparaiso and then the Emiliana Vineyard. Head to the Casablanca Valley where you enjoy four included tastings as you learn about Chile’s burgeoning wine industry. Then explore sights like ‘La Sebastiana’ house in the UNESCO World Heritage-listed town of Valparaiso. Enjoy a private tour of the historic port city of Valparaíso and the nearby 'Garden City' of Viña del Mar. In Valparaíso, explore the colorful, quirky former residence of poet Pablo Neruda, ride funiculars up the city's steep hills and visit La Sebastiana, the lauded poet's one-time home. Then set out for Viña del Mar, known for its lengthy beach, numerous parks and dynamic party scene. Spend free time perusing Easter Island artifacts at the Museo Fonk or discover Viña del Mar's historic palaces hidden among stands of modern architecture. The colorful port town of Valparaíso makes a popular day trip from Santiago, but getting there by public transport can be inconvenient and intimidating for first-time visitors. This private full-day tour ensures you travel in comfort and includes a guided walking tour of Valparaiso, a ride on the funicular, and boat cruise around the harbor. Hotel pickup and drop-off is included. Discover two gorgeous cities along Chile’s central coastline: Viña del Mar and Valparaiso, a UNESCO World Heritage site, on this private 4-hour tour. Experience in the company of just your friends and family the landmarks of Viña del Mar, including the Flower Clock, Reñaca and San Martin Avenue. Then, explore Valparaiso’s hilly maze of cobblestone streets and historic funiculars like Paseo 21 de Mayo and Concepción Hill. Along the way, hear engaging commentary from your personal guide-and-chauffeur. Hotel transport included. This is a unique tour that gives our clients the oportunity of enjoy the best of Chile, our wines, our culture and our nature. A wonderful experience that will take them to get to know one of the best wineries in our country, Emiliana, and one of the most interesting cities of Chile, Valparaiso, one of the main ports of Chile, one of the most famous cities in our country, declared a World Heritage Site by UNESCO in 2003 for the beauty of its architecture and the art that is breathed in all its streets. And besides all that , we will take our clients to see the magnificent sea lyons during a boat trip through the bay of Valparaiso. Paseo privado por Vaparaíso y Viña del Mar desde Santiago, día completo. Ya que se trata de un tour privado, trataremos que se sienta como viajando con amigos, si desea ver algún lugar con más detenimiento solo tendrá que indicarlo, no tendrá que viajar con personas que no conozca ni en grandes grupos difíciles de manejar. Le mostraremos el encanto de Valparaiso y Viña del Mar y también visitaremos el Valle de Casablanca donde degustará los mejores vinos Chilenosy démas está decir que haremos lo que este en nuestras manos por que este sea un excelente Tour para Usted. Todo lo que necesitas conocer del litoral central de Chile en un solo día! Disfruta de esta experiencia única en donde podrás recorrer las coloridas calles en los cerros de Valparaíso, conocer el hermoso reloj de flores de Viña, ver los leones marinos en la costa, degustar el famoso vino chileno en Casablanca, y mucho más, todo en un city tour que finaliza con la imperdible puesta de sol en el Pacífico. Traslado incluido desde y hasta la comodidad de su hotel en Santiago.